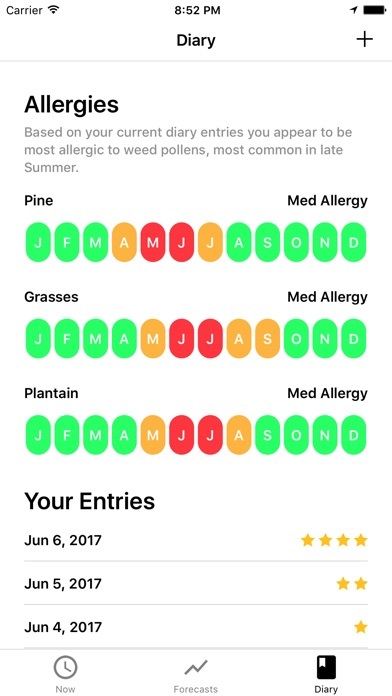 Great iPhone app that’s easy to use with a good UI (and much better than the other popular pollen tracking app). The map is fantastic for travelers especially. However, I’m bummed that there isn’t a complication for Apple Watch, at least not one that I can find. Something that would show the current pollen count or level. Above and beyond would be infograph complication support to show the current and forecast counts (like weather). That would make it above and beyond the best pollen app out there. 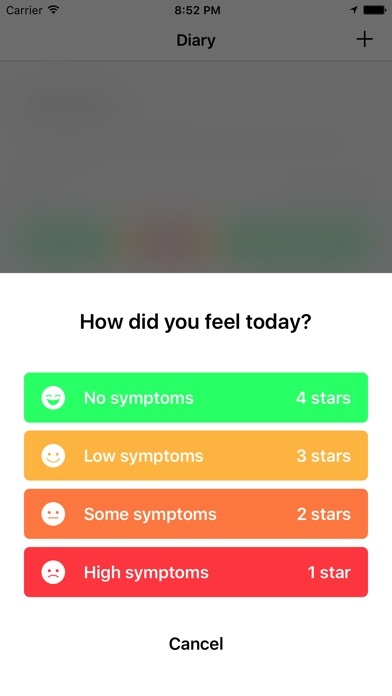 So I have been looking for a great allergy and pollen app for a while, and came across this app I was blown away. 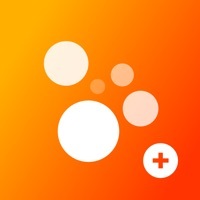 Great design, great user experience, great information! Love the journal, it’s super easy. 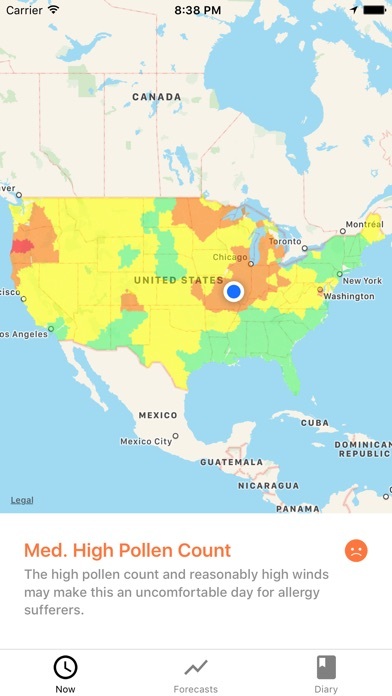 I think this is probably the best pollen tracking app out there. Thanks for making it! I really like how simple the app is. No fluff needed. I would like to see a widget on my iPhone so it makes it that much easier to use the app. I’d love to see settings for notifications by pollen type. Also, please add support for the Infograph watch complications. I live in an area where Mold and Juniper/Cedar are high at different intervals. This app only shows Juniper as the only pollen in my area AT ALL TIMES. Why? There are other pollens or allergens besides juniper. I’m frustrated I paid for this app. will not work at all if you do not allow full device location services. does not allow for any form of manual location entry, like a zip code. should be ZERO stars. I paid $1.99 for the Pro version and none of the features work except for the map. I go to the free version to check the temp, types of pollen, etc. Highly disappointed that I wasted $1.99. The app is very intuitive and easy to use, however, there are some things that are missing that could be very beneficial for the users. 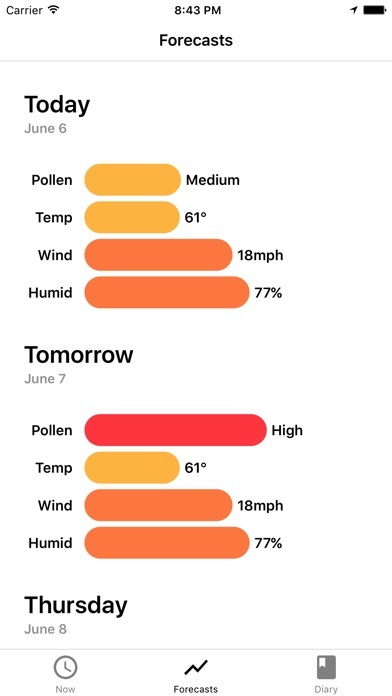 First, I will be nice to have a widget to access the pollen forecast on the fly without the need of opening the app. Second, the user should have the ability of saving locations by zip code, etc. , this option could be very useful when traveling. Also, the user should have the ability of deciding when (time) to receive daily notifications, and or filter notifications by the severity of the forecasts. In addition, app notifications are not working at this time. A today wider would be a nice addition.